The Vault Bar at Boundary London is a late-night subterranean bar offering nibbles/snacks for relaxed, informal drinks. At the bar, you’ll find fantastic value wines, the majority available by the glass, plus great cocktails and beers. TraTra has a group dining area at the far end of the restaurant that can host 10 to 24 persons across separate tables. The area is open plan to accentuate the atmosphere of the restaurant for informal group dining. Bespoke exclusive hire packages available upon request. We keep it coming until you say stop! Great space super friendly staff and really on top of things. Would definitely recommend ! Charcuterie and the frites were lovely, however a little limited on the cheese selection for the sharing board.. all a bit samey. Waitress was very attentive and pleasant. Restaurant was pretty and would have been really nice if it was busier (I know this can’t be helped). However the evening was slightly dampend by the really quiet atmosphere. At 6pm we were the only diners in there. This wouldn’t be a problem if it wasn’t for the sassy ‘supervisor/manager’ we could clearly see (and hear!) shouting at the staff in the kitchen about something- think it was about having their phones out.. they were clearly bored from the lack of work. She was strutting about and seemed very unprofessional, then we saw her throw some food into her mouth in the kitchen- I think that’s just as unhygienic as having your phone out! Also quite difficult to find as the ‘TraTra’ signs were pretty hidden. We enjoyed an hour and a half of bottomless Charcuterie on a Thursday evening. The food and wine was lovely and the staff were attentive and friendly. It wasn't very busy which we really enjoyed because it was the perfect place for us sit, relax and properly catch up. Nice venue but i was a little disappointed in the food. The fish platter was not available so that's a quarter of the options gone. We had the veg and charcuterie boards which were good but then we had some additional plates (the croquettes and the haddock beignets) which were far too salty to the point that we did not finish them. The wine selection is good and very reasonable, the staff are friendly and attentive. Have been here quite a number of times and have had a fab time on each occasion. Restaurant has a really nice cozy vibe, food is great drinks. Had a great time and brilliant value for money. I think the servers could have checked on us a little bit more as we had to find someone to order more drinks every time we needed another. Fine food. Good wine selection. Nice place with a beautiful open kitchen. Service could be a bit more attentive. Music was too loud for us. Overpriced and limited menu choice, not sure why they changed the menu. Have been earlier in the year and the food was amazing, £18pp for a board of salami and some cheese, better value buying from M&S! Average! Very unclear what you are actually getting! Veggie board was not really good as everything was deep fried and you can really only each so much of that. Cheeseboard you didn’t get much cheese.. it just didn’t seem very good value or very well put together. Was quite disappointed as it was a special occasion with friends visiting and we were looking forward to it very much! Great value, very nice. Did book it thinking it was bottemless cheese as that's what it was marketed at but you get very little cheese but lots of cured meat. We really enjoyed their bottomless charcuterie board menu. The drinks are also cheap during their happy hour slots (£3.50 for wine and £5 for cocktails), and some nice meats and cheese selections. Lovely service. The staff are a credit to the place. They were very attentive and warm. The outdoor terrace was very nice. And the food was good. An overall good experience which both my date and I enjoyed very much. Nice food. The music was much too loud though and we couldn’t have a conversation during dinner. Asked for the music to be turned down a little but were told that the manager wouldn’t allow this. Although it is a good idea to have a DJ in the bar, perhaps music could be kept at a reasonable level until at least 10 pm so people can hear what each other are saying during dinner. Wouldn’t go back. Great vibe and very friendly service. All you can eat charcuterie is highly recommended! Such a great find. 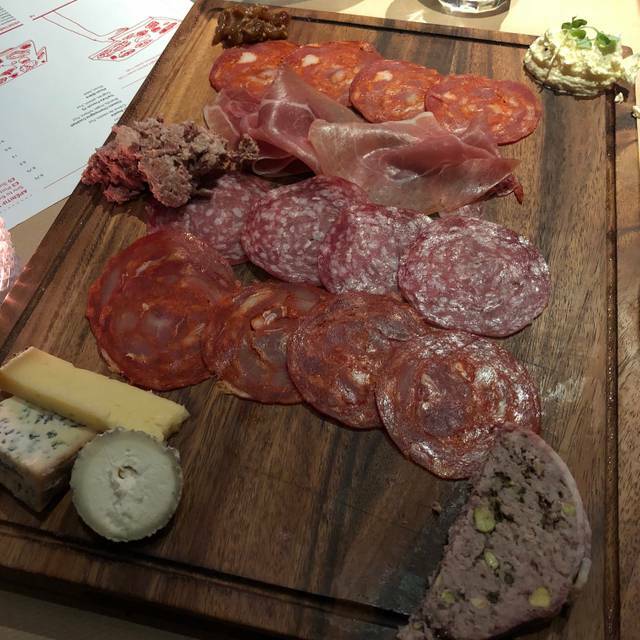 Bottomless charcuterie for £10pp is unheard of in London and it was super delicious. Our waiter was very helpful and prompt to refill our boards. Wasn’t keen on the hostess though. As soon as we walked in she told us how much time we had left, even before we got to our table. Fair enough there’s a booking policy, but service with a smile always wins. Still, I would come back here again. We came here as a group, but it would also be a great date night spot. Really good value for money and excellent drinks (made all the better by happy hour). The service is fantastic, with friendly and efficient staff. We have been twice in the past couple of weeks. The cheese portions should be bigger and it would be nice to have a desert to finish on a sweet note..
My friend and I booked a table at 5pm on a Saturday for the unlimited charcuterie deal @ £10pp - great value, great service and tasty food. We also took advantage of happy hour between 5 and 6pm. We went for the unlimited charcuterie board and it was very good value for money. Didn't have to ask the waitress for a top up once. It just kept coming as soon as the board was nearly empty another appeared! Lovely relaxed vibe and cheap drinks between 5-6pm on Saturdays. I went to Tra Tra with my girlfriend to indulge with their endless charcuterie platter on a Friday after work. Despite getting busy, as you can imagine, their service was on point and the food was good. We took advantage of their happy hour too, their house red is decent enough to pair with the food and the beer though limited in choice suited me just fine. The only downside is the limited amount of cheese per platter, though for the cost it’s churlish to complain too much. Good food with nice atmosphere and friendly service. Strong points are: great décor, interesting food concept, prompt and responsive service. The drawbacks are that it's extremely loud - uncomfortably so, and I struggle to understand the pairing of loud music with food or a meal, experiences based on mindfulness, conversation and connection. The loud music was a huge drawback. Also the food is good, but focused more on the restaurant's "model" than on customer experience of fantastic, thoughtful food options. It's focused on simplicity and mass production, and they do both these things well. By all means visit if loud bar environments are your thing, and if you are keener on trendy experiences than on moments focused on high quality eating. My first time at TraTra after hearing such positive things from friends and seeing articles on their £10 bottomless charcuterie/cheese boards. I wasn't disappointed at all! Reviews had mentioned slow service but the waitress we had was very attentive and we didn't even have to think about getting a new board before she'd switched them over! For £10 each, you can't really fault it. You get some stilton, a cheddar of some sort, a small variety of meats, bread and whipped butter. Go before 7 and you can get some £5.50 cocktails too, brilliant value for a date night or get together with friends. Staff friendly and helpful, didn't have to wait for food. I booked the restaurant with my fiancé only and hr ahead of our dining slot. The food was outstanding and our host in particular was fantastic. The dark restaurant had that nostalgic ‘90’s era’ west end restaurant/club vibe which I love. We’re very much excited about dining here again. Would highly recommend. The food was amazing and replenished quickly. Staff were lovely, really friendly and welcoming without being too in-your-face. Nothing to write home about. Okay value if you get there for the £10 per person bottomless platter. Not much variety. 4 meats and 2 cheeses. Didn’t like the bread and the butter was very warm/soft. Unlikely to visit this place twice. Had to get up to pay as was waiting forever to pay. Nothing wrong with the experience, just nothing exciting. Great concept, but falls short in practice. The menu is very limited- not just with regards to the chesse/meats on offer, but also no salad/fresh veg option. We ordered the bottomless platter, but wanted vegetables on the side, so ordered the only one close enough on the menu- but it was tempura/deep fried veg. A little disappointing. The place was at half capacity, meaning only 2-3 tables with customers, but the service was slow and inattentive. I'd run out of my cocktail, but no-one came to take my glass or order for a second one. We also had to search for the waiter to order our second board. The music was too loud, so customers were having to shout above it to be heard. The only saving grace- amazing cocktail (only had 1 as couldn't get a waiter to order more), and Aesop soap in the bathrooms ❤! This was excellent, we did the unlimited charcuterie for £10pp and it was perfect. We originally were worried it would be one of those places that would get very stingy with bringing more out but the service was unbelievable, they would keep coming over to see how we were doing and asking if we wanted another platter and within seconds another one would arrive. Amazing value, great service, definitely worth the trip. Unlimited charcuterie for £18, although lovely seemed a little pricey - very tight with the cheese! I would recommend you get there for the £10 deal before 7pm. Nice underground ambiance,friendly staff. I went for the unlimited cheese & charcuterie platter for 10£ per head we were two. It was very average quality of meats,bread and almost none existing cheese. For 20£ you can get a very large cheese and charcuterie platter in other places. Next time i will spend my money at the rooftop instead. Had a truly fantastic experience. While the food was lovely (it's hard to bungle cheese and meat plates), the service was atrocious. During an anniversary dinner, the host claimed we didn't have a reservation because he couldn't be bothered to look 6 slots down on the printed guest list. Then at our table with a prominent view of their un-appealing florescent-lit kitchen, our server was a mess. She didn't offer to let us taste our £30 bottle of wine, slapped our tapas plated down without one word about which cheeses and meats we were going to enjoy, half-heartedly said, essentially, 'computer says no' when we asked if we could have a side of vegetables, and disappeared for 20 min while we tried to flag down anyone for the bill. The food was nice, but definitely not worth the hassle of am award and negative experience (all in a restaurant that was less than 1/3 full of patrons). Thumbs DOWN. We were making the most of the unlimited cheese & charcuterie for a tenner deal and it made for a lot of fun. It wasn’t the best selection and began to get samey but the restaurant was pretty empty so we felt well looked after and enjoyed ourselves heaps in this underground gem. Very quiet but good atmosphere. Nice music and excellent service. Ordered the bottomless charcuterie board which was really good value and a gorgeous wine to go with. Lovely atmosphere, even when we were the first ones there. Staff are very attentive, the food kept coming. The food was great and had a nice selection of drinks to choose from for the aperitif time. The only suggestion i could make was to have a bit more variety of meats for the bottomless charcuterie. All in all it was a great evening meal.